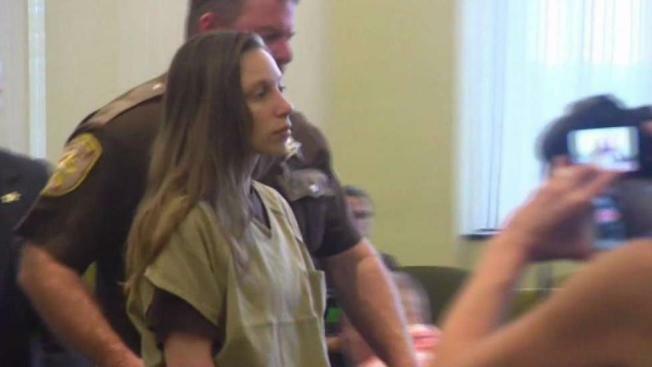 Joanne Shaw, 25, of Rochester, New Hampshire, appeared in court after allegedly trying to kidnap a 1-year-old girl. A New Hampshire woman appeared in court Monday afternoon after prosecutors say she tried to kidnap a stranger's infant daughter. Joanne Shaw, 25, of Rochester, didn't answer NBC Boston's questions as she headed into Strafford Superior Court. "These facts, frankly, represent the unspeakable nightmare of any parent," said Assistant County Attorney Joachim Barth. Officials say Shaw was walking along Washington Street in Rochester just before 9 a.m. Saturday when a man stopped to ask if she was OK. That's when Shaw allegedly jumped into his vehicle and started unbuckling his 1-year-old daughter in the backseat. "She gets into the car and made a statement, 'I'm taking your child,'" Barth said. Prosecutors say as the father brought the car to a stop, Shaw grabbed the little girl and took off running. The man chased her down and wrestled his daughter away. "The danger, from our perspective, speaks for itself," Barth told reporters Monday. Shaw's attorney told the judge the facts of this case are "sensationalized," but refused to comment to reporters outside court. According to court documents, Shaw has a criminal past and a history of mental illness. She just recently lost custody of her own 6-month-old child. Prosecutors say even after police arrived, Shaw continued showing signs of a detachment from reality. "She continued to stare at the child and make physical efforts in presence of police officers to regain possession of the child," Barth explained. Shaw was held on $25,000 cash-only bail. NBC Boston connected with the father of the child, but he refused an interview.